The Southern Ontario Glider Group Inc. (SOGGI) is a radio controlled model sailplane club in the Hamilton, Ontario region. SOGGI is a charter club of the Model Aeronautics Association of Canada (MAAC). In Our Model Aircraft , Flying Sites , Club Photo Gallery and Video Archive pages, you can learn more about the basic concepts of R/C soaring, the facilities that we use, and the airplanes that we fly. Aeromodeling is also very much a social activity. See our Calendar of Events for SOGGI’s schedule of Membership Meetings, Contests, Public Outreach, and Social Events. For information about joining SOGGI, click About . 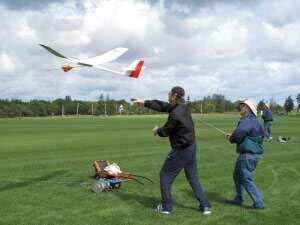 People seeing radio controlled sailplanes for the first time are frequently surprised at their performance capabilities. Rising columns of air provide the “Lift” for graceful flights lasting from a few minutes to an hour or more. Our search for Lift extends from horizon to horizon. SOGGI offers Flight Instruction for beginners. Our Instructors will help you to master the basic flying skills required for safe launches and landings. As you progress, we will teach you how to find and use thermal lift, to achieve extended flight times. Once you’ve accomplished these basic skills, try pursuing the goals set out by the League of Silent Flight (LSF) . At their own pace, each LSF participant attempts a series of increasingly difficult soaring tasks. As the participant completes each new LSF Level, accreditation is awarded. LSF Levels are widely recognized as a standard measure of R/C Soaring skill and experience. Participation in contests is another way to develop piloting skill. Several times a year, SOGGI stages friendly soaring competitions. Contests are open to all skill levels, and we invite other clubs to join in. Come make new friends, have fun, see some good flying, and discuss technique with other pilots. For now though, we’d just like to share with you the beauty, and the pure fun of silent flight.